Thanks to those giving me feedback. Even if you think it is unimportant, please send feedback. Here's what I learned: what I write is too long and too infrequent. So as of today the columns becomes shorter (This one is ~760 words excluding lists/charts; which is 3.6 (!) times shorter than the previous) and hopefully a bit more frequent. I'm thinking a column every 3 weeks, instead of every 2 months or so. Please email me about what you would like to see or hear, or if you'd like to get off the list, thanks! It happens every few months, with some regularity. Markets take a turn south, and everything starts moving down, except the inverted ETFs (those that are short the market, or invested in puts). Even if I pick the least correlated ETFs -- those which look like they are trying to stay away from the herd -- even those, suddenly start moving down, together with the herd. Sometimes, not always, the precious metals move the opposite way, but as market historians know, investing in Gold has been, on average, a pretty bad idea. After a great Gold rush run, in the past 12 months, Gold is up a measly 6.6%, while the S&P500 is up more than 20%. 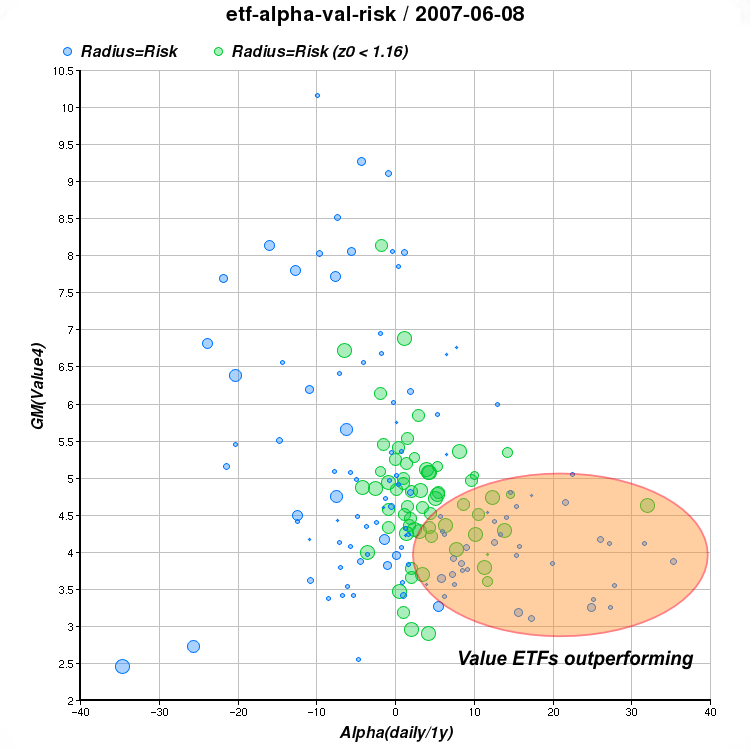 I was much more worried around May 10, 2006 when I first saw the "everything turns down" phenomenon in the ETF data I started collecting in February 2006. At least now this has become a familiar pattern. The fears now are that earnings are slowing down and the markets are over-extended. In Q1, 2007 there were similar fears, expectations for the S&P500 corporate earnings were for about +3% YoY (same quarter, year over year) earnings gains. When earnings came out at about +9% YoY, on average, the markets rallied with great force. Is this time the same as in the last summer, or last February? Different? Will earnings really be much weaker this time around? I don't know. If I ever know, and I'm working on it, I promise to share. Here's what I do know. The more I look at the raw-data and the more powerful tools I use, the easier it becomes the get insight. I'll provide more evidence for that in future columns. Which leads me to today's main (and shorter!) theme. Some measure of risk based on volatility and unpredictability (beta and sigma) vs. the S&P500. It is hard to make sense of it. It is certainly very hard to get any feel of what's "going on" in the markets based on this seemingly random data. Add more data and it becomes even more incomprehensible. But convert the data to a chart and suddenly things become so much clearer. Human eyes in combination with the human brain can grasp patterns amazingly well. This is what we realize when we say that a picture is worth a thousand words, or when we can "recognize" a smiling clown in the complex shape of a cloud overhead; all in the blink of an eye. In this case we map the 1st two numeric columns to the X, and Y axes and the 3rd column to the radius of the circle. We also paint circles where the 3rd column is smaller than 1.16, green instead of blue and invert the ratio so smaller ratios produce bigger green circles to emphasize circles that are "less risky." Almost all the circles that are significantly on the right half of the chart (i.e. ETFs that have outperformed the S&P500 independently of market direction) happen to be in the bottom half of the chart (i.e. they are value ETFs). And by making this very obvious observation, we've just (I hope) convinced ourselves that current markets have a strong preference for value over growth. This partly explains why our current strategy has been weighting value as an important factor in picking ETFs. Things, of course can always change, but then we hope that our charts and models will change too. In the next column we'll see how can we visualize a market strategy. Stay tuned.